Joan Wickersham's most recent book of fiction is The News from Spain (Knopf). 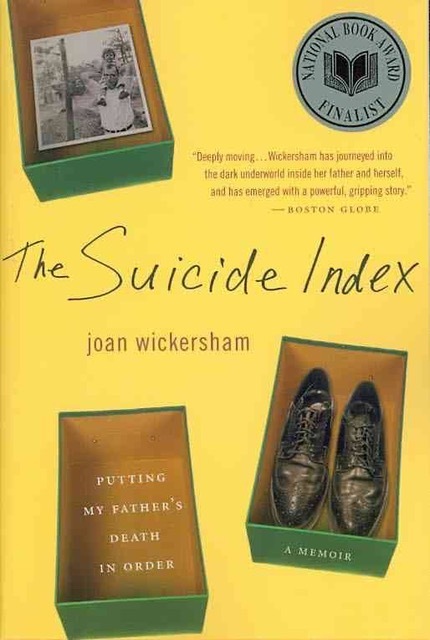 Her memoir The Suicide Index (Houghton Mifflin Harcourt) was a National Book Award Finalist. She is also the author of a novel, The Paper Anniversary (Viking). Her fiction has appeared in magazines including Agni, One Story, Glimmer Train, The Hudson Review, New England Review, Ploughshares, and Story, and has been published in The Best American Short Stories and The Best American Nonrequired Reading. Her op-ed column runs regularly in The Boston Globe. She has published essays and reviews in The Los Angeles Times and The International Herald Tribune; and has read her work on National Public Radio’s “On Point” and “Morning Edition.” She also writes frequently about architecture, including “The Lurker,” a column she created for Architecture Boston magazine. She has received the Ploughshares Cohen Award for Best Short Story and has been awarded grants by the National Endowment for the Arts, The Massachusetts Cultural Council, the MacDowell Colony, and Yaddo. She has taught at Harvard, Emerson, the University of Massachusetts (Boston), and the Bennington Writing Seminars. Joan graduated from Yale with a degree in art history, and she lives in Cambridge, Massachusetts with her husband and two sons. In these seven beautifully wrought variations on a theme, a series of characters trace eternal yet ever-changing patterns of love and longing, connection and loss. The stories range over centuries and continents—from eighteenth-century Vienna, where Mozart and his librettist Da Ponte are collaborating on their operas, to America in the 1940s, where a love triangle unfolds among a doctor, a journalist, and the president’s wife. With uncanny emotional exactitude, Wickersham shows how we never really know what’s in someone else’s heart, or in our own; and how love, like storytelling, is ultimately a work of the imagination. The News from Spain was named one of the year's best books by Kirkus Reviews, the San Francisco Chronicle, and NPR. Two of the stories were chosen for The Best American Short Stories and The Best American Nonrequired Reading. Contact Joan’s agent, Gail Hochman at Brandt & Hochman Literary Agents, ghochman@bromasite.com.